Project Overview: This is a proposal to build a 4-story, 121-bed convalescent and congregate care facility at the current site of the Kitayama Restaurant on South Bristol. Why We Were Watching: Under the city’s General Plan, a project of this sort is not allowed at the requested location, and hence its approval requires a General Plan amendment. Such changes to the voter-approved land use designations are always of concern, and in this case neighbors have expressed worries about the building’s compatibility with neighboring residential uses. Nothing further scheduled at this time. February 12, 2019: With Council member Duffield absent, the City Council voted unanimously to approve the application. January 17, 2019: The County’s Airport Land Use Commission reviewed the City’s request for a general plan amendment as Item 1 on their agenda. They unanimously found the amendment consistent with the County’s Airport Environs Land Use Plan. If they had not, the City Council could have overriden their determination, but it would have taken a super-majority vote. December 6, 2018: Planning Commission conducted a hearing on the project and at its conclusion recommended the City Council certify the EIR and approve the project (which will require them to approve changes to the General Plan and zoning). September 28, 2018: Public comments were due on the Environmental Impact Report, which was released for review on August 10. The City’s responses to the comments have since been posted. September 13, 2018: A special Planning Commission meeting included the promised “study session” on the Harbor Pointe Senior Living proposal. Many local residents appeared, most objecting to the project in their neighborhood. September 6, 2018: The Planning Commission was scheduled to review the updated project at a study session, but on August 30 it was announced the meeting on that date had been cancelled and will likely be held, instead, as a special meeting on September 13. August 10, 2018: Environmental Impact Report, posted for a 50-day public review. To receive a written response from the City, comments on the EIR must be received by the close of business on September 28. July 19, 2018: In his oral report to the Planning Commission, the Community Development Director indicated a study session on this project would be heard by them at their August 9 meeting. However, we understand that has been postponed to early September. January 23, 2018: As Item 4 on its consent calendar, the City Council approved an amendment to the EIR contract. October 13, 2017: The case log indicates revised project plans were submitted on this date. February 23, 2017: Prior to release of the EIR, the Planning Commission heard about and discussed the proposal, without action, as Item 4 on its agenda. The “study session” was well attended by Bayview and Santa Ana Heights neighbors, most quite critical of the project as currently proposed. See the City video. August 15, 2016: A scoping meeting for the project’s Environmental Impact Report was held, with comments due by August 22. Preparation of the EIR presumably started soon after. This entry was posted in News, Watch List and tagged general plan amendments, Harbor Pointe, Land Use, senior living on February 19, 2017 by Jim Mosher. Why We Were Watching: The rumored development is inconsistent with the property’s existing General Plan designation for Parks and Recreation use. The current owner or potential buyer would therefore need to make a request to change that designation, and the City has no obligation to comply. SPON views such requests to change the General Plan with great skepticism. February 14, 2017: “Mayor Muldoon requested future agenda items on the zoning and future use of the Newport Beach Tennis Club and the roundabout at Bayside Drive” (see City Council Minutes, Item XII). 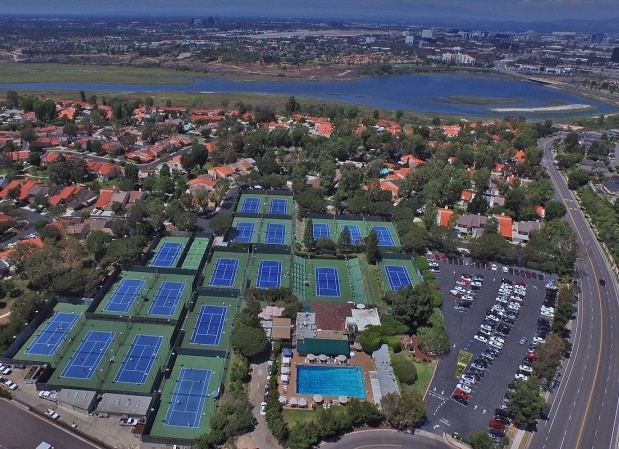 February 28, 2017: Council unanimously approves request for staff to prepare future agenda item providing a “Summary of the Existing General Plan Designation and Zoning for the Newport Beach Tennis Club” (see City Council Minutes, Item XIII). Via an email sent in late January 2017, I promised to keep you updated on activities regarding the Newport Beach Tennis Club. Recently, an interested buyer of the underlying land and the property owner approached the City at a staff level (our planning staff) to determine what would be required to accommodate residential uses at the site. Staff told them, as I told you previously, about the requirement for a change in the General Plan (via an Amendment) and the underlying zoning. Changes in the General Plan are discretionary actions by the City Council – in other words, the Council can say yes or no to them. In some cases, if enough residential is added or peak hour trips are added, a vote of the Newport Beach electorate is also required following any Council approval of a General Plan Amendment (GPA). Please know that we have not been notified by either the property owner or the interested buyer of their intent to begin processing a GPA and other related zoning actions. Should an application be filed, I will let you know as well as provide information regarding the proposed review schedule and at what time you may comment on the proposed project. The process will include public review and comment opportunities on any draft environmental document, as well as public hearings before both the Planning Commission and City Council. One additional FYI. At tonight’s Council meeting, Mayor Kevin Muldoon (also the District #4 representative) intends to give the Tennis Club a proclamation for its service to the community. No other action is planned for tonight’s meeting. To date (April 22, 2017), SPON does not believe any formal application for land use change has been submitted to the CIty. The requested discussion of the zoning status of the property was at one time listed as a tentative Study Session item for the Council’s May 9 meeting, but it is not known if that is still planned. Note: title photo from Newport Beach Tennis Club website. This entry was posted in News, Watch List and tagged General Plan, general plan amendments, Land Use, newport beach tennis club on January 22, 2017 by Jim Mosher. It is up to us to elect City Council members who will represent residents. While SPON cannot take positions on candidates, it does encourage everyone to become informed about the candidates’ positions on issues important to the quality of life in Newport Beach. Note: As of December 3, the Orange County Registrar of Voters has posted the Official Results and the even more official and detailed Statement of Votes for the November 6, 2018, election (see our Election Forums page). The final precinct level results can be further visualized by hovering over the Registrar’s interactive maps (after selecting “Contest” in panel to left of map). For preliminary statewide totals, visit the California Secretary of State’s Semi-Official Election Results page. As for Newport Beach, one new face, Joy Brenner, will be joining the Council, replacing outgoing member Scott Peotter. The local Measure T requiring a public vote on future City financing by certificates of participation passed handily. A variety of groups organized forums at which the public had a chance to learn about City candidates and ballot issues. The following information is primarily based on that on the City Clerk’s 2018 Election page. All those listed were free and open to the public. See the Clerk’s page for additional information about the election time line, the Council candidates profiles and ballot statements, and the City ballot measure (on which SPON, also, takes no position). Recordings of some of the forum events can be viewed online on the City’s NBTV streaming video site (see note at end of table regarding the City’s recording policy). Additional recordings can be found by following the SPON videos link at right or in the table below. In particular, SPON’s YouTube Election Forums playlist provides links to YouTube recordings by SPON and others from past years. Speak Up Newport videos from 2014 of council candidates and ballot Measure Y are separately available on Vimeo. Doors open – 7:00 a.m.
Forum – 7:30 – 9:00 a.m. Doors open – 5:30 p.m.
Forum – 7:30 9:00 a.m.
Meet & greet – 6:00 p.m.
Forum – 7:00 – 8:00 p.m. Reception – 5:30 – 6:30 p.m.
Forum – 6:30 – 8:30 p.m. Note regarding City recording of election forums: although the City has no clear policy on what third-party events it films and posts, it appears at least some of this year’s forums are being recorded by City contractors and may be available for viewing on the City website as well as broadcast on its public cable channel, Newport Beach TV. In 2016, the City posted the Newport Chamber, West Newport, Speak Up and Feet to the Fire forums. In 2014, it posted none. Because there is no policy, it is also possible it might broadcast some without posting them (or vice versa). The West Newport moderators specifically said their forum was being recorded for broadcast in September and October. The City’s policy on recording and broadcasting election forums was briefly debated as Item 3 at the Council’s September 27, 2016, meeting, and was supposed to come back for a decision, but never did. The video of that meeting is, itself, interesting to watch. This entry was posted in Events, News and tagged candidates, city council candidates, city council elections, election, municipal elections, newport beach elections on August 22, 2016 by SPON-Karen. 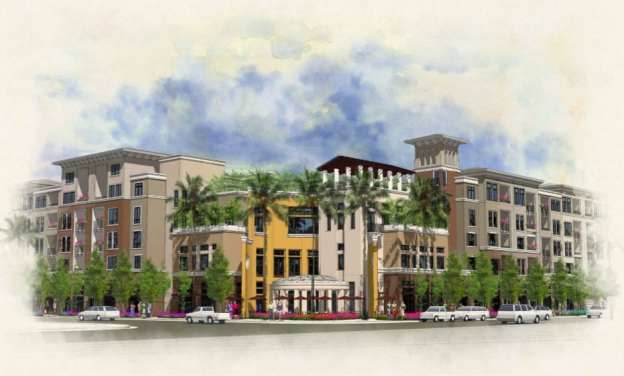 Project Overview: The originally proposed project was composed of 384 residential units and 5,677 square feet of retail space, replacing an existing small shopping center. View the project proposal here (large file; takes a minute to load). Why We’re Watching: Among other things, the proposal includes a request for “adjustments to development standards pertaining to building height”. In other words, the developers are seeking an exception to the current building height (an example of SPOT ZONING). The developers are also seeking a WAIVER of a General Plan Policy that requires them to dedicate a minimum of ½ acre for a neighborhood park. Apparently, they don’t have room for a park (again . . . another example of SPOT ZONING). Read the Planning Commission Staff Report for yourself. 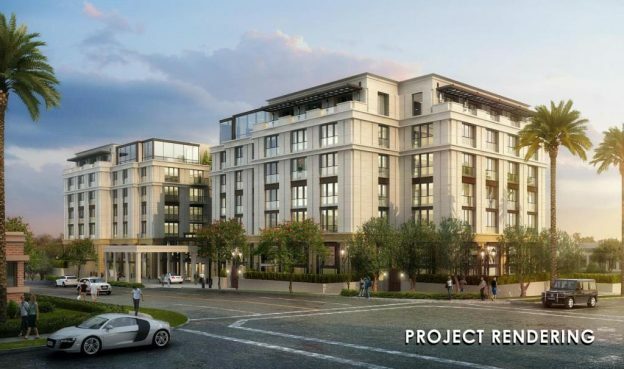 March 2016: The Residences at Newport Place, an Airport Area proposed project, went before the Planning Commission for an initial review on March 3, 2016. Subsequent meetings scheduled for May were temporarily tabled as a result of concerns from both the public and the Planning Commission. June 2016: The applicant requested a continuance and the project finally came back to the Planning Commission for review at their June 9 meeting. SPON submitted comments to the Planning Commission on three separate occasions before the project came back to Planning Commission on June 9 (see Helpful Links below). The Commission was further concerned about a lack of responsiveness to the comments received in March. In a 4-1 vote they denied the developer’s request to continue the hearings and rejected the project. July 2016: The developer appealed the decision to City Council and the appeal hearing was set for the Council’s July 26, 2016, meeting (Public Notice). The City Council unanimously rejected the appeal, forcing the developer to start over with a completely new application if they wish to continue. Next Step: Let’s keep the standing-room-only momentum going! City meetings are great opportunities for residents to come together in a show of solidarity and for getting their comments included in the public record. 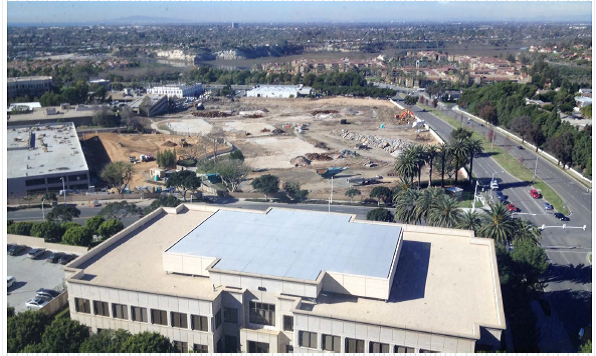 This entry was posted in News, Watch List and tagged General Plan Exceptions, mixed use project, Residences at Newport Place on July 28, 2016 by SPON-Karen. Planning Commission Meeting Videos here! After many months of public requests by SPON for the Newport Beach Planning Commission meetings to be video recorded and televised (as they are in most other cities), on February 23, 2016, the City Council voted 2 (Dixon, Petros) in favor to 4 (Selich, Muldoon, Duffield, Peotter) against televising. In response, from March 3, 2016, though January 19, 2017, SPON, at its own expense, recorded and posted Planning Commission meeting videos for the public to view online. Watch them on SPON’s YouTube Channel here or in the SPON Video Library. The City finally relented by placing Item 12 on the Council’s January 24, 2017, consent calendar, directing staff to begin “filming” and making available the Planning Commission meetings and adopting Resolution No. 2017-10, amending then City Council Policy A-13 to remind the Commissioners to behave with decorum while being filmed. The item was unanimously approved, without comment. Starting February 9, 2017, the City finally took over responsibility for video recording and posting the meetings. Those can be found in the City Planning Commission video archive. The meetings are still not broadcast or streamed live, but in addition to being archived, the recordings are later shown on the City’s cable station, Newport Beach TV. Overview: In response to numerous earlier requests from SPON, Mayor Dixon asked that the question of televising Planning Commission meetings be put on the February 23, 2016, Council agenda. More than 70 community members either emailed the Council or showed up in person to support the idea of televising, live streaming and archiving videos of the meetings. No one wrote or spoke in opposition. Council Action: Despite the clear and unanimous public sentiment, Council voted not to televise the meetings [Dixon and Petros voted in favor of televising; Selich, Muldoon, Duffield and Peotter voted to oppose televising; Curry was absent]. The Council members’ arguments for and against are well worth listening to. Click here to view the Video; click on Agenda Item #16 to skip directly to this matter at 59:16 minutes. The equipment and largely automated technology is already in place for City Council meetings and needs only to be turned on during the Commission meetings and manned. Staff indicated there was ample budget to cover the $3,600/year extra expense ($50 per hour). Most meetings are under two hours so the actual cost will likely be closer to $2,500/year. The Planning Commission itself expressed displeasure both with the Council’s decision and with the fact that no one asked their views on the matter. However an expected noticed public discussion of the matter by the Commission has not yet materialized. SPON’s Next Step: We are not giving up on this request. While we work to gather more support in the community and on the Council, SPON, at its own expense, has retained a videographer who will videotape Planning Commission Meetings beginning March 3. Videos will be posted to our website and/or You Tube for public viewing. Be sure to watch for our progress on this action on our website. Write letters to the editors of our local newspapers. Be sure to include your name, city of residence and phone number (not for publication but allows editors to check with you if they have questions). This entry was posted in News, Opinion, Watch List and tagged Newport Beach, Planning Commission, Televise Hearings, video record, youtube on July 18, 2016 by SPON-Karen. As a 501(c)3 organization, SPON cannot, and does not, take a position on the merits of candidates for elective office. Providing information to the public is, however, part of SPON’s core mission, and as such — in the interest of an informed electorate — SPON provides links to videos of public election forums, present and past, at which competing candidates for the Newport Beach City Council have expressed their views on issues of interest to residents. To access our full playlist of YouTube videos click on the little horizontal bars in the upper left-hand corner of the video below. Links to additional election forum videos can be found by following the first link above. This is a collection of videos that may be of interest to members of the SPON community. To access the full playlist, click on the little horizontal bars in the upper left-hand corner of the video below. Community interest videos recorded and broadcast by the City can be found linked to from their Newport Beach Television (“NBTV”) webpages. Many of the NBTV videos can also be found on the YouTube page of Edward Olen. These videos archive presentations made at SPON’s GPAC workshops. For additional details, including copies of the PowerPoints, see the SPON General Plan Update page. To access the full playlist, click on the little horizontal bars in the upper left-hand corner of the video below. These are videos, recorded at SPON’s expense, of public workshops conducted by the City of Newport Beach. To see the full list, click on the little horizontal bars in the upper left-hand corner of the video below and scroll through the selections. 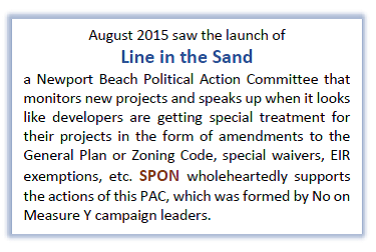 From March 3, 2016, though January 19, 2017, SPON, at its own expense, recorded and posted the Newport Beach Planning Commission meetings for public review. To see the full list, click on the little horizontal bars in the upper left-hand corner of the following video and then scroll through the selections. Alternatively, to see the full playlist directly on SPON’s YouTube channel click on this link. Effective February 9, 2017, the City of Newport Beach assumed responsibility for filming Planning Commission meetings, and maintains them from that date forward on the city’s website. The City also records its City Council meetings, the videos of which can be similarly found here. This entry was posted in Events, News, Watch List and tagged community workshops, election forums, Planning Commission, videos, youtube on March 24, 2016 by SPON-Karen. A downloadable/printable version of this Newsletter is available here. an increase in the height limit for the site from 35 to 87 feet! Coastal Commission. If the Coastal Commission signs off on it, the Local Coastal Program Implementation Plan, approved by the Planning Commission in October and by the City Council in November, would transfer a good deal of control over development projects to City government. Which is fine with us as long as the City’s actions are guided by its own coastal policies and the Coastal Act. Case in point: The City approved the Back Bay Landing Project in its original form, which included building a new bulkhead, multi-story water-edge homes and a 65-foot viewing tower. The Coastal Commission deferred a final decision on the bulkhead and homes in December BUT denied the tower, saying it would be “inconsistent with the character of the area and result in adverse visual impacts to public views of the bay and the cliffs of Upper Newport Bay”. Don’t you wonder why our City Council didn’t make that statement? And we encourage you to continue writing to City Council in support of this request. City Council will hear this matter on February 23, so time is of the essence. (Email form here). We’ve been trying a new community outreach model: A few of our members have graciously opened their homes for monthly informational luncheons so people can visit with like-minded residents, keep up with the City’s development pipeline (no simple task!) and find out what they can do to help. SPON is run entirely by volunteers and funded exclusively with members’ tax-deductible donations. Every bit helps. But to carry out our mission, we need people just as much as we need money. If you care about our residential and environmental qualities and have time or special skills you’d like to contribute, we’ll be thrilled to hear from you. 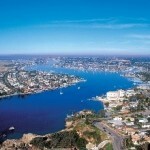 We all love Newport Beach and we need to show it! Tell us how you can help here. If you can donate, form is here. May 11, 12 or 13: Coastal Commission hearing on Banning Ranch in Long Beach. Exact date and venue TBD. May 21: SPON Annual Meeting at the Environmental Nature Center. Details here. November 8: Election Day! Remember, we need a City Council that cares about residents, so don’t forget to ask questions and research candidates before you vote. This entry was posted in Events, News, Opinion, Watch List and tagged Accomplishments, Beacon Bay Carwash, mariners mile, Museum House, Newsletter, Planning Commission, Save the date, SPON on February 22, 2016 by SPON-Karen. SPON has re-launched its Community Newsletter. Current and past editions will be available here. This entry was posted in News, Opinion and tagged editions, Newsletter, SPON on May 16, 2015 by SPON-Karen.